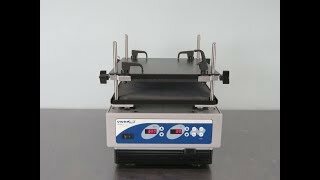 The VWR DM-S2500 in a highspeed microplate shaker used for a variety of studies including cytogenetic suspension, cell lysis, mixing tissue samples, chemical cell lysis, among a number of other applications. This plate shaker works well with emulsification of bipolar dense fluids along with mixing samples in small diameter tubes. The VWR DMS-2500 microplate shaker has a programmable speed range of 600 to 2500 RPM with an accuracy of ±25RPM. Additionally, this micro titer shaker comes with a built in timer capable of running from 1 to 9999 seconds, or 166 minutes of continuous operation. The VWR DMS 2500 Plate Shaker has a maximum load capacity of 50lbs and can easily be adjusted to various heights in the range of 1/8” to 5” inches. System includes a pulsing feature which starts and stops in different set point intervals. This feature enhances the agitation of the sample which is required for difficult mixing applications. Height Range 1/8" to 5"
This VWR DMS-2500 microplate shaker has been tested and is currently ready to be shipped. All of our lab equpiment comes backed with our standard warranty. If you have any questions don't hesitate to give us a call.